Having met Toby and Lilly I headed back to the Chalk Farm Road end of Hawley Crescent and waited for another stranger that might fit another section of the coloured frontage on the new buildings where I’d shot Toby’s portrait. So much of my 100 Strangers Project turns out to be waiting around! My process is always to find a background, and then to seek a stranger that could set it off. Maybe 500 people went past, with a couple of rejections, before I met Belle. As we walked up the street to the last section of shade on the south facing facade, we chatted. 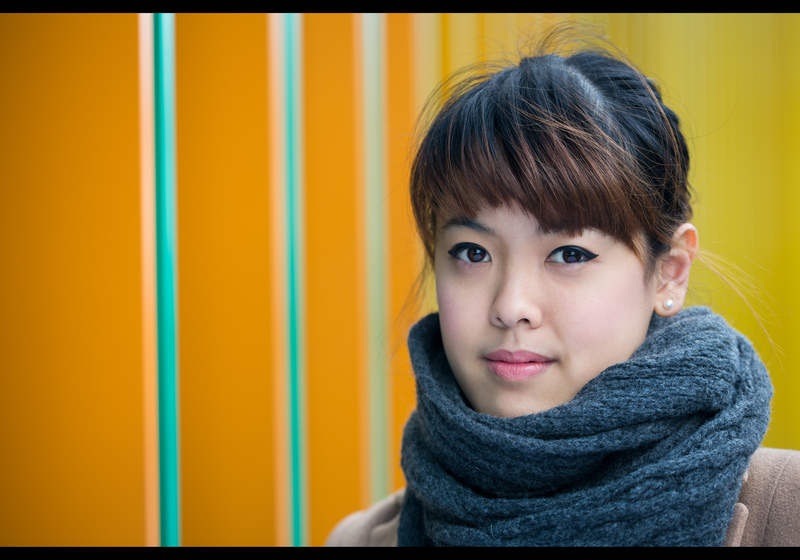 She’s from Thailand, studying textiles here in London at the moment. This makes perfect sense – she is an exceptionally stylish individual. Belle held a large white reflector beneath her; I avoided the gold option, fearing the warmer light might blend her in too much with the backdrop. We snapped away at a section where the building curves and the colour piles up even quicker in the background. With the colour changing as the wall retreats and curves, it made for a really different effect from in Toby’s portrait. Before we could chat too much more, her phone went and she had to head off to lunch, back to the pub outside which I’d stopped her. Her friends must have been inside and seen her led off down the side street. Belle – thanks again for taking a moment to stop. Best of luck with your textiles degree, and I hope you like your portrait. This is portrait #34 of my 100 Strangers Project – check out the group page and get involved.